A beautiful warm, sunny day today. Bookman made chocolate chip peanut butter pancakes for breakfast. We got into the garden early and did some weeding. Then I went for my annual eye exam and wasn’t going to get new glasses but Bookman said here, try these on. So I did just because and they looked really good. A different shape and color than the usual. So I should have new glasses in a week or so. 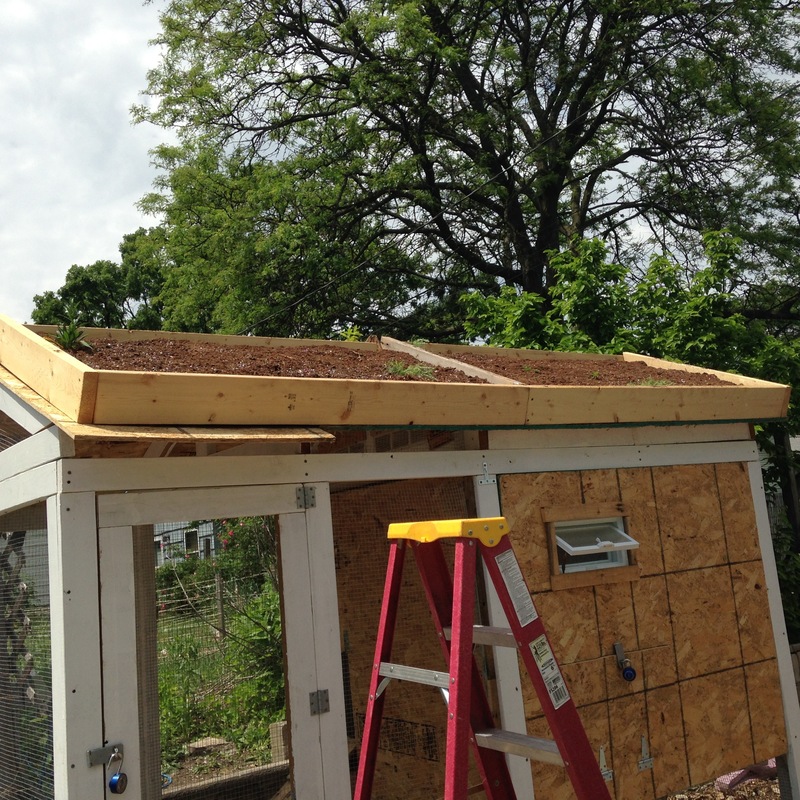 Then on the way home we stopped at the home improvement store for a straw bale so we can start mounding up the potatoes, and a bit more peat moss so we could finish the green roof beds. After lunch we finished the green roof and then we planted it. It looks so sad and empty because I didn’t get that many plants because I didn’t know how many to get or what would do well. The perennials that are planted in the beds are: pasque flower, blue wood’s aster, catmint, spicy orange creeping thyme and — we had to do it — hens and chicks. We seeded lots of annuals: nasturtium, sweet alyssum, sweet william, comsos, and an annual aster. Other perennials we planted today: hardy kiwi vines (male and female), northern dropseed prairie grass, a thornless gooseberry (variety “Jeanne”). We also planted some herbs: basil (we started from seed), curry plant, a perennial leek, self-heal, French tarragon, and a Vietnamese herb I have no idea what to do with but it sounded cool and looks pretty, shiso. In addition, we planted mustard, pole beans (tongues of fire), and green beans (masai). I think I forgot to mention yesterday that earlier last week we planted a lettuce mix, radish, beets, cosmic purple carrots, atomic red carrots, and a variety of Japanese turnip I can’t recall the name of at the moment. The radishes are sprouting already other things might be sprouting too but we have row cover fabric over the bed to keep squirrels from digging and I can’t see anything else through it. I noticed yesterday the honeyberries are ripe. I planted two of these shrubs last spring after giving up on my dream of having blueberries. I just could not get the soil acidic enough for the blueberries after trying for three years. The honeyberry shrubs are about two feet high and for only their second year, had a nice cup of fruit on them. Have you ever had a honeyberry before? I had not until yesterday. They are dark blue like a blueberry and tear-drop shaped and a little smaller than my thumbnail. Some people say they taste like blueberries but they absolutely do not. They taste like no berry and every berry. A little tart, a little sweet, when you think of “berry flavored” that is what they taste like. Eventually these two shrubs are going to be highly prolific and Bookman and I are already thinking of jam. The ones I picked this year will make some tasty pancakes or maybe some muffins. The one with the white head is Marianne, the black one with the white speckles is Mrs. Dashwood, the solid black one is Margaret and the red-brown one is Elinor. Oh, and after I told you yesterday about the hijinks of getting them all into the coop at night, they proved my a liar. Bookman and I went out last night a little later than usual and they were all nested down in the coop quietly peeping themselves to sleep. Go figure. What a wonderful holiday weekend this has been. It is back to work for me Tuesday morning. I wish I had a few more days like today and then I would really few caught up with things in the garden. I have not been online much at all this weekend and I was already behind in my blog reading so my apologies if I have not stopped by your blog lately. I will endeavor to catch up on that throughout this week. I’m a thornless gooseberry, yes indeed. I love that you went out later than usual and they’d put themselves to bed. We have a cat kind of like that–he comes in nicely before dark, but only when he’s good and ready. Jeanne, and you are supposedly sweeter than the thorny gooseberries 🙂 The Dashwoods are a fun learning experience. Apparently they do not like to be rushed off to bed and will take care of themselves if we just let them, kind of like your cat! The Dashwoods are just lovely – especially Marianne, she’s stunning. I’d never heard of honeyberries but now I have to investigate. We’ve never tried to grow any kind of berry before. Would they like the mid-south climate? I love the parade ‼️ When will they start laying eggs ? The coop with the green roof looks really nice ! Helen, they make me laugh every morning 🙂 I think they start laying around 5-6 months. So not for a while yet. And thanks! We are pretty pleased with how the green roof turned out. Now to get things to grow on it! What a productive weekend – Fantastic for you 🙂 Loving the Dashwoods…the saga continues! Me too! Those weekends were for the winter or later in the summer. This is the time to clear the clutter, plant the seeds, and shape the coming season! I love to try fruits that I never had before. The honeyberries look and sound good. Folks think that I am crazy but I tend to like my fruit, especially berries on the tart side so these seem like something I might enjoy. Laurie, you’ll have to catch you neighbor out in the yard so you can ask about the birds! 🙂 Glad you enjoyed the morning parade. They are always waiting at the door! I hope your first day back to work goes well! They still sound like babies! All that peeping. They’re so beautiful. I just realized that a green roof is a great place to plant things that are pretty but that might go slithering all around the garden, things like mints and creeping plants. Can’t wait to see how they grow. Joan, yes, they still peep but sometimes they manage a kind of cluck when they are upset with each other. They are growing up to be very pretty if I do say so myself! 🙂 The roof is in direct sun all day long and we have no plans to water it once things get going because hauling water up a ladder is not our idea of fun, so the test will be what plants can survive variable and possibly extreme conditions. I am amazed at what you and Bookman have accomplished! I keep making grand plans, but never seem to get anything done. I told myself this morning that I am probably one of those people who should drop all pretense of having plans. The green roof will fill in nicely and the Dashwoods…well, they are simply charming and adorable. Grad, thanks! We are pretty amazed ourselves! There is still lots to do but the hardest stuff is finally done. We are very glad about that because we are both really tired! haha, I love that you planted hens and chicks. 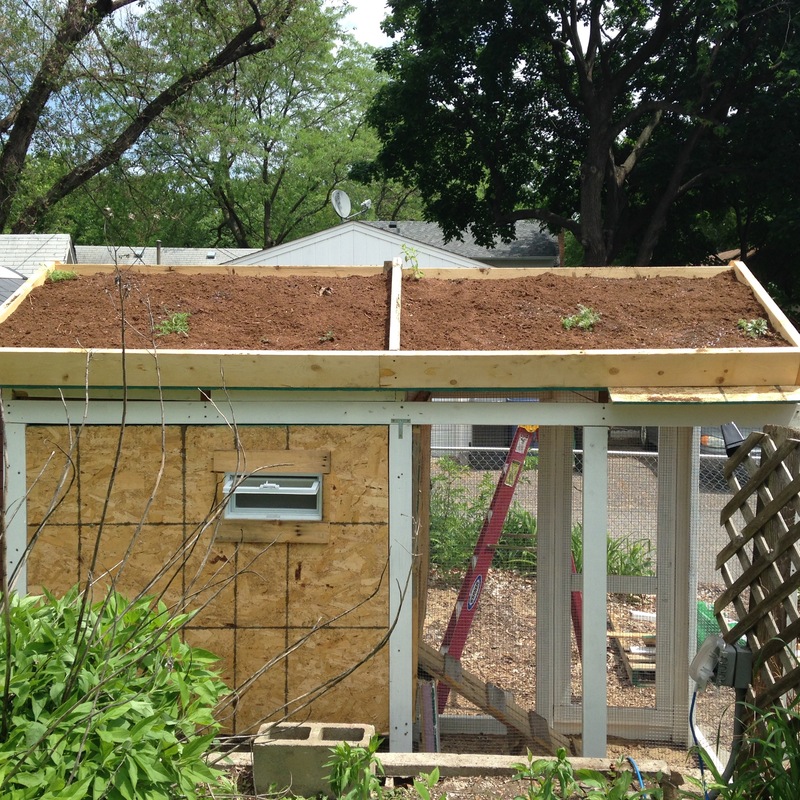 I’m so looking forward to seeing your green roof turn into a rainbow one! Chooks look wonderful. So healthy. You two have done a wonderful job with them. What a project. whisperinggums, that was Bookman’s idea, he said it would be wrong if we didn’t 🙂 What a project is right! They are healthy and happy and easy to care for and fun. though I might change my mind about the easy to care for when it is -20 and snowing! We’ll just have to wait a few months for that stage of the story I guess! I love the Dashwoods–they look like such nice sensible girls. And I love the green roof–just about everything you planted will expand and fill the gaps nicely. Now I’m off to the garden center to look for honeyberries–never heard of them. 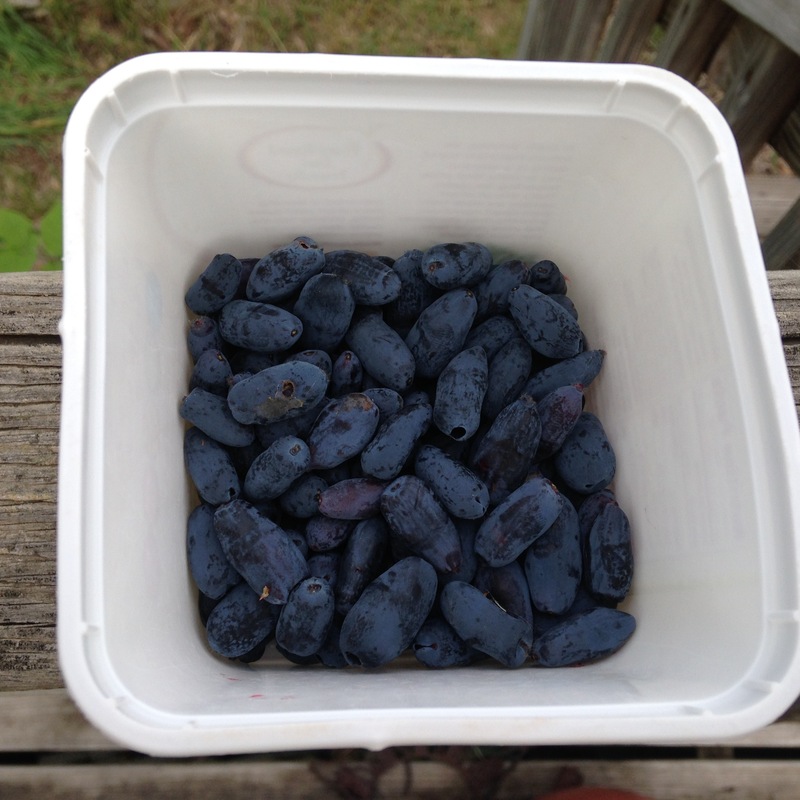 My mom used to plant blueberries in whiskey barrels to get the right acidic soil, btw. Thanks Jane! I have heard about growing blueberries in containers too. Perhaps one day I will decide to try again and go that route. Hope you found some honeyberries!